In 2016 Donald Trump stunned the organized left by defeating Hillary Clinton with ease in a stunning upset. The organized left of mainstream media, the Democrat Party, corrupted Deep State governmental agencies and the far left tech giants were left in tears in defeat. Hillary was supposed to win. They fought for it. It was her turn. 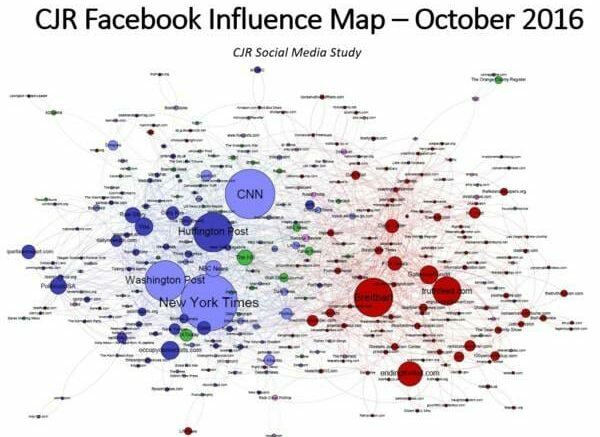 Following the election a Harvard study and a similar study at Columbia Journalism Review discovered and listed the top media influencers during the 2016 election. The studies recorded similar results. The 2016 election was the first national election where conservatives on a grand scale rejected mainstream media and went elsewhere for their news and content. 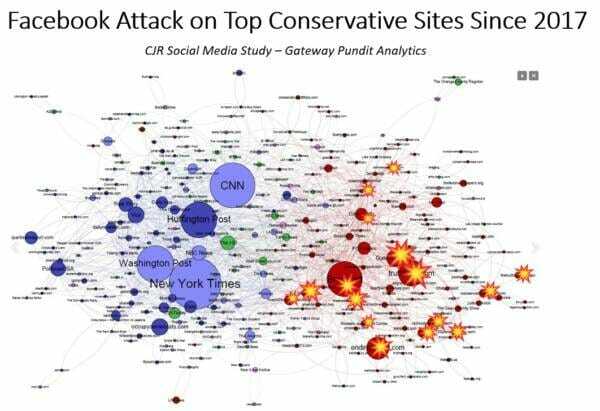 Conservatives went to Facebook, Twitter, Reddit, FOX News, and independent conservative publishers for content. And so the organized left vowed to destroy these content providers. Breitbart, Western Journal, Gateway Pundit, Conservative Review, Young Cons, Right Wing News, Zerohedge, Infowars, etc. were top conservative influencers in 2016. And here, after two years of purposeful targeting, is that same map showing the conservative publishers who have been targeted and censored by Facebook since 2017. Conservatives dominated social media in 2016 where they were able to get the truth uncensored. Facebook ended that in 2017 and 2018. Last year the Gateway Pundit spoke with two of the top conservative publishers in America. These are numbers from just two of the top conservative publishers in America on Facebook. This does not include the thousands of other conservative publishers across the country who lost all of their traffic coming from Facebook. Here at The Gateway Pundit our Facebook traffic has been effectively eliminated after we were ranked as the 4th most influential conservative publisher in the 2016 election. We continue to flourish because we have such a vast organic traffic base. Several other top conservative publishers were not so lucky and shut down operations since 2016. This is a bloodbath. Facebook wiped out conservative content to American subscribers. Google, Twitter and Instagram also target, censor and delete conservative publishers. James O’Keefe and Project Veritas have revealed this targeting is intentional. The Republican Party stood back and watched this happen. The GOP “Pretend” Party did nothing as this massacre of free speech occurred. Today Donald Trump Jr. wrote a piece at The Hill of the censorship of his social media pages. My latest OP-Ed on Tech Censorship check it out and RT. This was a good report. Many of us have been speaking out for a year. Republicans sit back as free speech is stolen. More than half of the top independent conservative publishers from 2016 are already gone. The post In 2016 Independent Conservative Publishers Pushed Trump Over Finish Line – So Democrats and Tech Giants Deleted Them and GOP Did Nothing appeared first on The Gateway Pundit.